Today is our final Behind the Scenes episode of the 90-day challenge. In this episode, we are going to take a look at our custom online course platform. I’ll show you how all the different pieces of our course platform fit together, and how to structure online courses. We’ll also discuss how we deliver our course materials in a way that meets our student’s needs. Before I worked in PPC management, or web analytics, I was a web developer. So when it came time to build a course platform, I went back to my roots, and put my web development skills to use. Now, our course system still uses a lot of pre-built software. So when I say it’s custom built, I am talking about the way we assembled all the parts of our platform. The back end of our course system has the developer’s equivalent of duck tape and super glue holding the pieces together. Why go through the hassle? Because to create a unique solution, it’s necessary to color outside the lines. 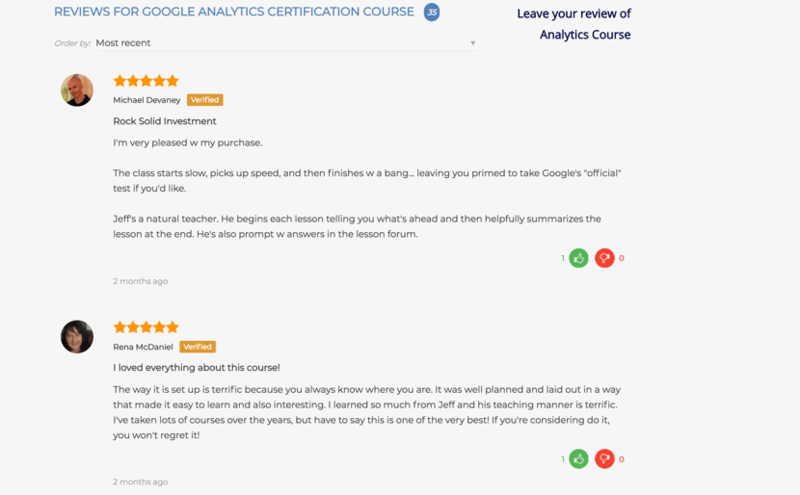 So even with a bootstrapped together custom course platform, the user experience gets compliments several times a week. We didn’t create a custom built course platform to be fancy. We did it because I couldn’t find precisely what I wanted in any one piece of software. It was important to me that our course software didn’t limit the student experience. We wanted our students to have a fluid, unique, and gratifying experience in every one of our courses. There are two pieces of technology at the center of our custom platform. Learn Dash is the core of our course platform. We shared a previous review of Learn Dash. And we love the way this software fits into custom designed sites. We also published a review of Vimeo Pro. All our course videos are hosted using Vimeo Pro. Everything else in our platform was adapted to fit together with elbow grease and code. We feel our efforts to go beyond the stock online learning systems show how much we care about our courses. And based on the reaction of our students, it’s worked out well so far. Within a course we have lessons. Each lesson has subtopics. And the lessons also include quizzes and assignments. A lesson represents a complete concept or skill within a course. The lesson assignments offer students an opportunity to practice their skills. And the quizzes give them a way to test their mastery of the material. 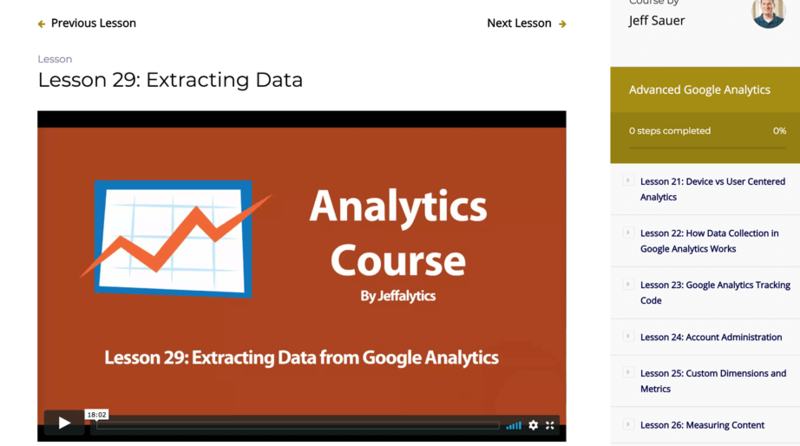 Here’s an example what our lessons look like inside of Analytics Course. Every one of our lessons features a video or set of videos that offer in-depth teachings. Many of our video lessons are very hands on. 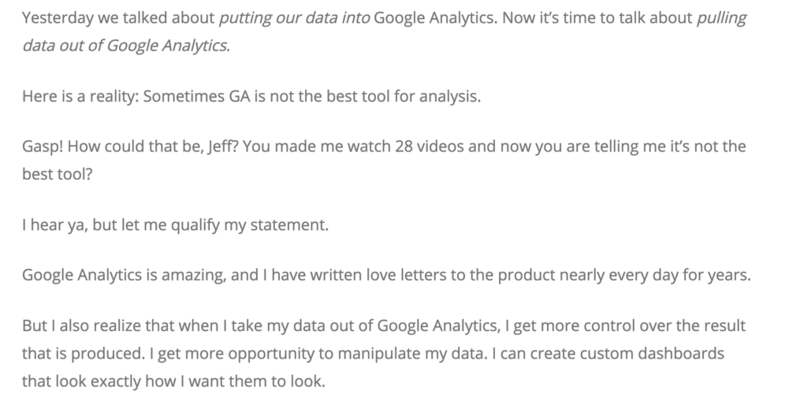 We go inside Google Analytics or AdWords and work through how to use these systems. Or we break down strategies and techniques using proprietary calculators and worksheets. We are continually making adjustments to our courses and lessons to improve the learning experience. Recently we’ve been breaking down our lessons out into more subtopics. The subtopics contain shorter, easy to consume mini-lessons. There’s also a full write up that goes with every lesson. The write-ups are usually 500 to 2000 word summaries of the material in the video. We also have a forum for every course. The forums have topics related to the lessons and modules in each course. Our forums are a place for students to ask questions and get direct feedback from me, as well as other students. We send email reminders for all our course lessons. The email reminders help keep students engaged in the courses. One of the most significant problems with online learning is the student drop off rate. So we use email reminders to help students stay on track. Our email reminders provide an extra dose of encouragement to keep our students going with the new skills they are working on mastering. We use Drip to send our lesson reminders. Our course platform also has student management capabilities. Our system allows us to see how many people have enrolled in a course. 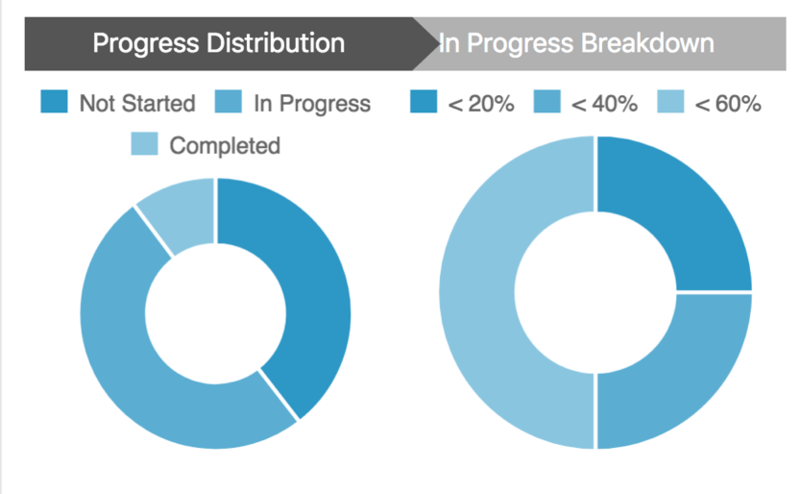 We can also see the overall progress of our students. And we can check on the progress of individual students. On the user interface side, students can see where they are in each course. Students can track their progress and check off lesson as they complete them. Our quizzes allow students to test their knowledge after completing their lessons. 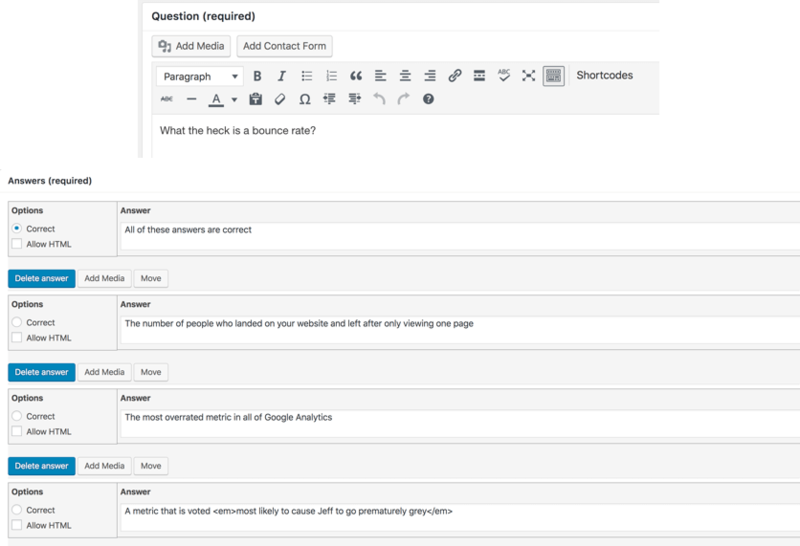 Below is an example of back-end system for adding quiz questions to our course interface. This system also shows us how well students score on our quizzes. 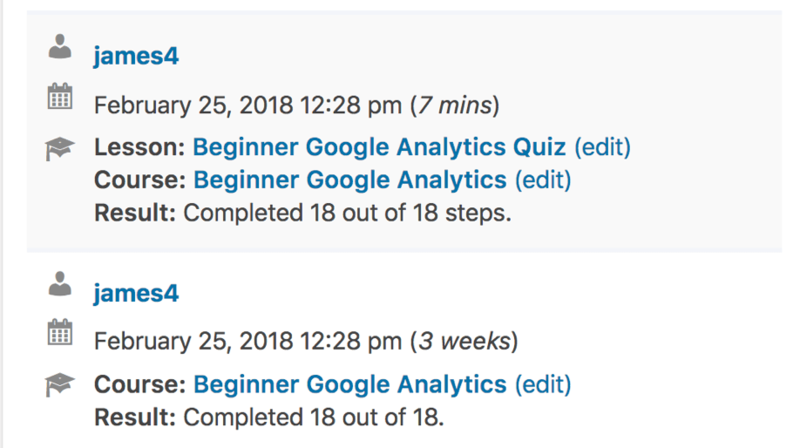 When I designed our Analytics Course quizzes, I thought I was developing some fairly easy tests. But more often than not students fail these quizzes the first time around. The challenging nature of our Analytics Course tests has turned out to be very beneficial for our students. This challenge motivates students to go back to the course and work through any material they didn’t understand on their first pass. The quizzes are an integral part of helping students prepare for the Google certification tests. Some course modules offer students the opportunity to earn a certificate of completion. In one our Tools of the Trade reviews, we showed you how we use the Reviewer plugin to capture and display student reviews. As a self-hosted network of courses, we take our student feedback and reviews to heart. Student satisfaction means an immense amount to the success of our business. Here are some of the considerations we make when we design a course. These principles have helped us create an enjoyable, and in-demand student experience. It’s important not to overwhelm your students. Breaking lessons, into subtopics and chunks of information helps make the learning experience more manageable. Our email reminders also help students move through our courses at a fluid pace. Our forums and private Facebook community provide students direct access to me. This access allows me to respond quickly to questions. Our community also offers our students an opportunity to network with each other. Quizzes and lessons stages allow students to achieve goals within each course. The progress and sense of accomplishment help motivate students to keep going. Our course navigation menus allow students to see where they are and quickly find the lessons they want to access. Letting students know what you’re going to teach them helps establish clear expectations for their progress. Learning can be a vulnerable experience. Our courses are built to foster student growth in a comfortable and safe environment. This an area where I get a lot of positive feedback. One of the tenants of our learning experience is to use real-world examples. Practical examples help students form a vision of how they will use the skills you’re teaching in their own work. Learning should not be intimidating. When you have fun, you learn more, and you feel encouraged to keep learning. Sometimes people think teaching means demonstrating how knowledgeable they are. But teaching is about increasing your student’s knowledge, not displaying your own aptitude. The job of the teacher is to make the information less complex. In our courses, we prioritize clarity over complexity. Our courses are designed to make complex topics easier to understand. I often provide very long explanations when going through concepts. It may be perceived as a fault of mine. But I think that is a short-sighted view. As a teacher, long-winded explanations are the difference between basic knowledge and retention of advanced concepts. Deep coverage works to my students’ advantage. In my courses, I talk about the stories and thought processes that lead to the strategies I teach. You can learn as much from the journey to finding a solution, as you can from the solution itself. We like to call back to past lessons where it fits in with the lesson material. We also like to point out upcoming information that relates to a present subject. Looking past and forward helps tie the whole course together. You can learn as much from your students and they can from you. Listen to their feedback, questions, and concerns. Even in an online course, address student questions as promptly as you can. And if you learn something relevant to your course from a student, share it with the student community. With that mind, did you enjoy this preview of the back end of our courses? Thanks for following along with our Behind the Scenes series! This post and video was episode 85 in our 90 Day Challenge digital marketing series.